SPARC calls on Sun Prairie to help kickstart Community Radio Program! 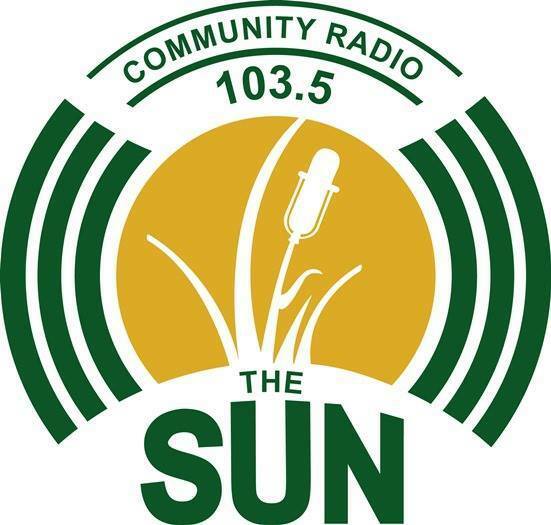 The Sun Prairie Action Resource Coalition (SPARC) urges area residents, businesses and organizations to contribute to the “Kickstarter” fundraising campaign for the planned 103.5 The Sun community radio station. The fundraising deadline is Aug. 19 at 11:49 a.m., and many more pledges are needed to launch the community radio station. If funded, The Sun would provide a much-needed local outlet to connect our community, giving local individuals, groups, and businesses a new forum for sharing news, information and opportunities, SPARC said. 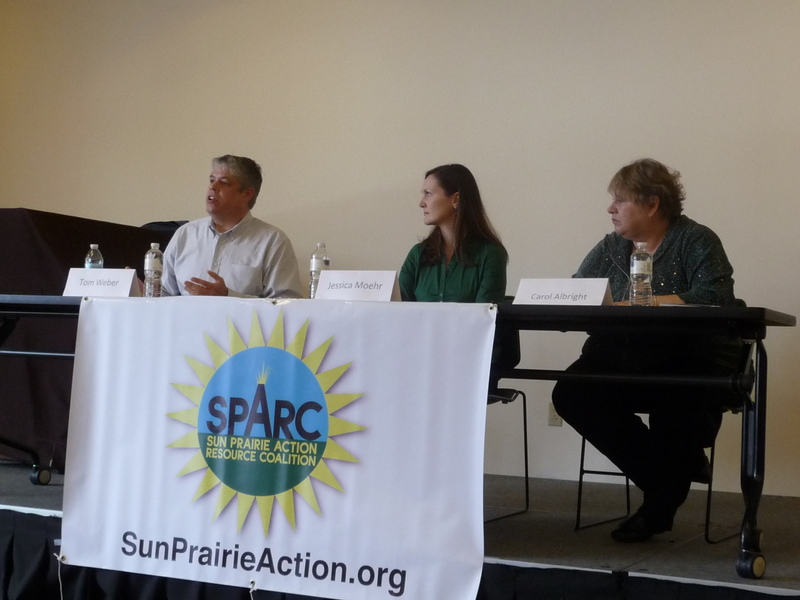 In a news release Wednesday, SPARC said it is urging its members and Sun Prairie residents to contribute $10 or $100 or whatever people can afford. SPARC also asks that you also share the link to the Kickstarter campaign – http://kck.st/1w3FAFq – on facebook and Twitter to help spread the word and support this effort. SPARC is offering its supporters a chance to contribute to a group donation to the program, and challenges other local community to groups to raise funds among their memberships also. SPARC members wishing to contribute to SPARC’s group contribution can send their donations to Heather DuBois Bourenane at 681 Broadway Drive, Sun Prairie, WI, 53590, to be included with the SPARC donation. At a donation level of $150 or more, donors receive an opportunity to host their own show and recognition on an Adopt-a-Watt plaque at the station. Deadline for contributing to this group donation is August 16, 2014. Please email SunPrairieAction@gmail.com with pledges or questions about the team donation. SPARC will also collect donations in person this Sunday when it hosts the Progressive Partners Picnic (free and open to all) at Orfan Park from 1:00 to 4:00 p.m). Donations intended for the community radio may be dropped off at this time by anyone not wishing to donate online. If the goal of $10,350 is not reached by August 19, the Sun Prairie Media Center will not be able to collect any of the money pledged (and all pledges made through SPARC will be returned). Media center director Jeff Robbins has reported that interest has been strong but much more is needed and soon but the time is growing short to turn that interest into tangible financial support. SPARC encourages other local community groups and organizations to help the Sun Prairie Media Center to get the word out and make this happen in our community. The Sun Prairie Media Center is a non-profit organization operating on a budget that covers the day-to-day operations of KSUN and KIDS-4, Sun Prairie’s two public access TV stations. It won’t cost much to operate ‘The Sun’ radio station once the initial costs are covered. The proposed community radio station would host talented local musicians that don’t get the airplay or recognition they deserve from local commercial radio. It would also feature local sports and forums on important community issues. Residents will have a large role in determining the programming of the radio station. Anyone who donates at least $10 to 103.5 The Sun Kickstarter campaign will receive some exclusive giveaways, including “103.5 The Sun Community Radio” stickers, flashlight keychains, t-shirts, and mugs. In addition, anyone who donates at the “Adopt-A-Watt” level of $103 will have their name etched on a plaque at the “103.5 The Sun Community Radio” studios. All donors will receive updates on the radio project and special on-air thanks once the station launches. “103.5 The Sun” is scheduled to be on the air in summer 2015. Additional information on the station and its progress is available at https://www.facebook.com/thesuncommunityradio?ref=br_tf. The Progressive Partners of Wisconsin’s Second Congressional District summer picnic will be held Sunday, August 3, from 1-4pm at Orfan Park in Sun Prairie! The Sun Prairie Action Resource Coalition is excited to host this quarterly meeting for the first time and looks forward to a fun, productive afternoon that will provide an opportunity for grassroots teams and area progressives to connect, share ideas, and talk about how local action works in our communities! All are welcome – RSPV today for this great chance to connect with local progressives! Click here for more details and to RSVP! We will have a sitter on hand to watch kids at the park during the “business” portion of this largely social event, so feel free to bring the whole family! In addition to plenty of free time for socializing and connecting with area progressives, we’ll be chatting with a few of our elected officials and fall candidates, and learning more about the Community Schools initiative in Sun Prairie and how we can organize locally to protect our public schools and provide an equal playing field for all students. Each of the grassroots teams will also provide a short summary of events/organizing activities since our last meeting. RAIN PLAN: In the event of stormy weather, we will send an announcement to all who RSVP’d and will hold the event at the Westside Community Building at 2598 West Main (corner of West Main and Highway C/Grand Ave). There is an outdoor shelter, however at Orfan Park, so we don’t plan to change the venue unless the weather is very bad. Hope to see you there! Friends, new & old, and families welcome! Please share this invitation widely and RSVP today! Want to see how far one little act of kindness can go? GROW IT FORWARD at the Sun Prairie Public Library! 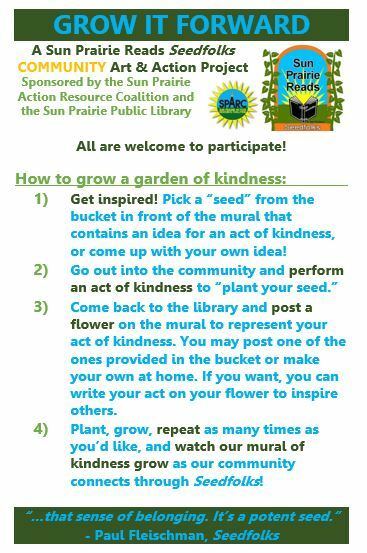 SPARC’s Grow it Forward Community Art & Action Project is a collaborative effort to “grow” an interactive garden mural at the library that represents random acts of kindness and connections that inspire all of us to “grow it forward” and build community in Sun Prairie. This art and action project provides an opportunity to embrace diversity and build community, two major themes of the Sun Prairie Reads novel, Seedfolks, through local acts of kindness. This is what the GROW IT FORWARD mural looked like on the first day – go check out for yourself what it looks like NOW that the garden of kindness has begun to grow! The mural is located on the large wall next to the entrance to the Children’s Library. For every act of kindness you do over the summer, place a flower on the mural on the library wall and watch us grow a garden of kindness together. Paper flowers – and “seeds” with ideas for local actions – are provided at the mural, or you can make your own. All are welcome to participate in the GROW IT FORWARD Project, which will continue as an ongoing project through the duration of the Seedfolks Sun Prairie Reads program. While you’re at the library, be sure to participate in the Summer Reading Programs for kids, teens & adults! And remember: the library is a collection site for our SnackSmart Program, which provides snacks to summer school. If you’d like to make a donation of a healthy snack (suggested items: nut-free, healthy snacks like fruit, NutriGrain bars, cheese sticks, no-sugar added applesauce, low-sugar cereals and low-sodium crackers). Just drop your snacks off at the bin behind the check-out desk – and be sure to add a flower to the wall if you do! We CAN make sure no kids learn hungry in our schools! SAVE THE DATE: SPARC will be hosting a second talk, on Sept. 11, 2014 at 6:30pm at the library, on Growing Community: Sharing our Stories. Please mark your calendars and joins us for this celebration of the diversity of our community and the value of connecting with one another. Paul Esser, former mayor of Sun Prairie, spoke at a recent SPARC meeting of his efforts to organize a local chapter of PFLAG, a national organization supporting LGBT individuals and their families. While Madison has its own PFLAG chapter, there’s a real ne ed to support our own growing community and the rural areas that surround it with a separate group around which families can connect and find support, as well as resources for education and advocacy. The group is now looking for members to sit on a local board to help lead this new group, and SPARC calls on its members to consider this invitation and opportunity to provide much-needed support for local LGBT families! There is an effort underway in the Sun Prairie area to start a PFLAG chapter. Founded in 1972 with the simple act of a mother publicly supporting her gay son, PFLAG is the nation’s largest family and ally organization. Made up of parents, families, friends, and straight allies united with people who are lesbian, gay, bisexual, and transgender (LGBT), PFLAG is committed to advancing equality and societal acceptance of LGBT people through its threefold mission of support, education and advocacy. PFLAG now has over 350 chapters and 200,000 members and supporters crossing multiple generations of American families in major urban centers, small cities and rural areas in all 50 states. There is a PFLAG chapter in Madison and they have indicated their support for the Sun Prairie area effort. The organizing effort has been initiated by the Sun Prairie United Methodist church. But since PFLAG is a nonreligious organization, the new chapter can not be attached to a religious organization nor can it be meeting in a religious facility. The national PFLAG organization wants to see five to eight people from the community take the lead. One or two of those could come from the Sun Prairie United Methodist Church but the others need to come from the area being served. The initial group will decide how frequently the chapter meets, location, and meeting format. The Madison chapter, for example, meets one Sunday afternoon a month for two hours with the first hour being devoted to a presentation and the second hour to sharing among the people present. The Madison participants are typically a combination of parents, friends and family members of LGBT people and LGBT community members. The contact people for the efforts thus far have been Paul & Carol Esser from the Methodist Church. They say the reason for having a Sun Prairie area PFLAG chapter when one already exists in Madison is that Sun Prairie is a suburban community in a rural setting. The needs and interest of LGBT people and their family and friends here is much different then in a highly urbanized college dominated city like Madison. For both youth and adults, the needs are unique so a Sun Prairie area chapter can better reflect and react to those needs. Paul Esser says he’d liked to see the geographic focus of this chapter be all of eastern Dane County and not restricted to just Sun Prairie. This will be one of the decisions that will be addressed by the initial group so it would be good if people from outside of Sun Prairie got involved. The Sun Prairie United Methodist Church is hosting a pot luck dinner meeting at its building on June 1 at 5 pm to begin serious discussions about the Sun Prairie area PFLAG chapter. After this meeting it is expected that a group of people not connected to the church will take over the efforts of getting the chapter underway and the Methodist church would become simply a supporter of the effort. All interested people in the community are invited to the June 1 meeting and they do not need to live in the City of Sun Prairie. The meeting will be at 702 North Street, Sun Prairie with the pot luck starting at 5 pm. The Madison chapter people will arrive at 5:45 pm so anyone not wanting to participate in the potluck is welcome to come at that time. For additional information you should contact Paul Esser at 608-837-3907 or ptespwi@gmail.com. 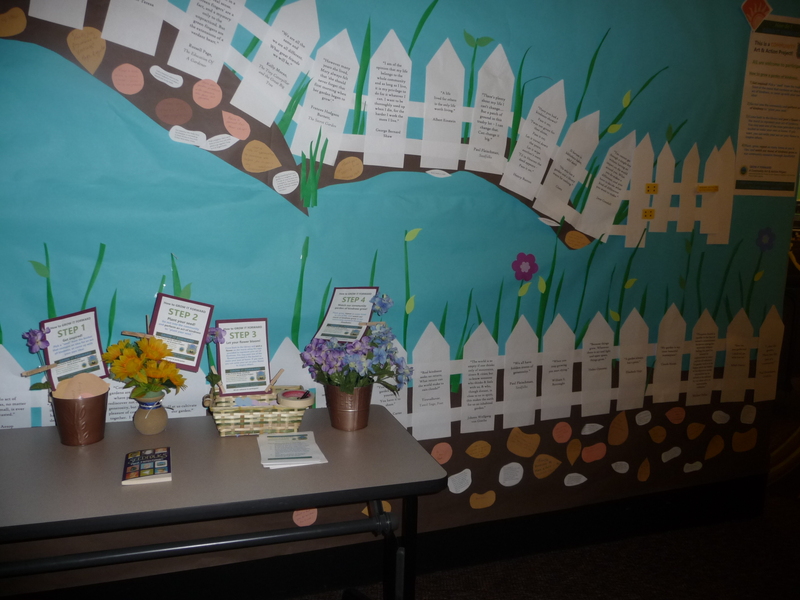 The Sun Prairie Action Resource Coalition (SPARC) is thrilled to collaborate with the Sun Prairie Public library through a “Growing Community” project that connects the Sun Prairie Reads novel, Seedfolks, by Paul Fleischman, to local actions that connect our community. Xue Vang (Bilingual Assistant, CH Bird Elementary). Building on the novel’s theme of gardening as a means of finding “common ground” to create a sense of a community, this session features a conversation exploring the possibilities of creating community across groups, languages, and cultures. “Growing Community” is an opportunity to share strategies and brainstorm ideas for making positive connections with our neighbors in meaningful and lasting ways, even when it seems like we might not have a lot in common. The session includes a hands-on workshop to launch SPARC’s Grow it Forward project: a community effort to “grow” an interactive garden mural at the library that will represents random acts of kindness and connections that inspire all of us to “grow it forward” and build community in Sun Prairie. This art and action project provides an opportunity to apply and embrace the novel’s themes of diversity and community through local acts of kindness. All are welcome to participate in the GROW IT FORWARD Community Art & Action Project, which will continue as an ongoing project through the duration of the Seedfolks Sun Prairie Reads program. The event is free and open to the public, and all are invited to help us grow this garden of kindness on the community mural! If you’re on facebook, you can RSVP here and invite your friends! Donate! 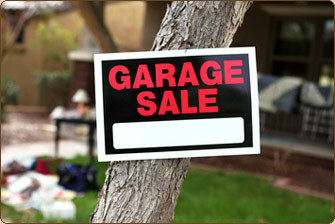 Garage sale items can be dropped off at the Mugan’s home, 751 Eddington Drive. Please call ahead to make sure that someone will be there. Karen can be reached at: 577-9141. Also, spread the word that Al Guyant is willing to pick-up items that people are able to deliver before the sale. You can arrange for pick-up by calling 825-8844. Note: as in previous years, unsold items will be donated to Red Barn to support local families. Volunteer! We need volunteers to help set-up, sort, and price on the Tuesday and Wednesday before the sale, volunteers to work on Thursday, Friday, and Saturday and also a take down crew to transport any unsold items to donation sites. Sign up online for a shift! Shop! Stop by during the sale and support SPARC with your purchases. Spread the Word! Please share this announcement and let your friends and neighbors know that proceeds will benefit the SPARC Local Action Fund 501(c)3, which goes to programs like SnackSmart to provide snacks to hungry kids in Sun Prairie Schools and help SPARC continue to hold community events like candidate forums and community conversations. Thank you, Sun Prairie, for your continued and generous support of our efforts to connect our neighbors around local actions that move our community forward! As some of you may have heard, Diane Ravitch is unable to join us on May 1st to discuss her new book. And while we’re disappointed and hope she recovers quickly, I wanted to let you know that the event will go on, and the organizers have already confirmed a very exciting lineup of speakers! 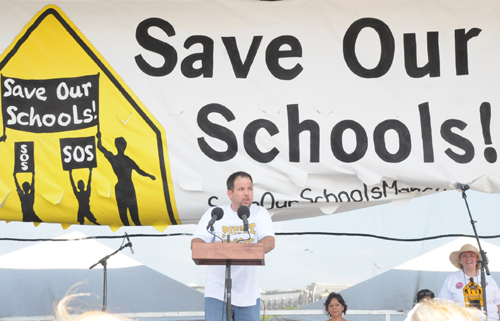 Come join the national movement to save our public schools! 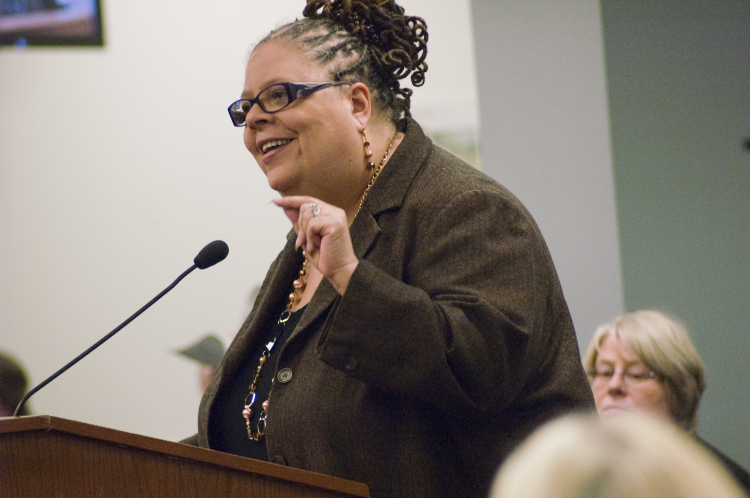 Chicago Teachers union president Karen Lewis and Texas school superintendent John Kuhn headline a rally in Wisconsin to beat back the assault on public education! Thursday, May 1, 2014, Monona Terrace, Madison. Grassroots networking social: 5:30-6:45. Program begins at 7:00. Please spread the word and plan to be there for this important event! I received an email from Diane Ravitch last night. Late last week Diane fell and damaged her knee. She has to have a knee replacement and has canceled all of her speaking events for the next 6 weeks. So that means she will not be speaking in Madison at the Monona Terrace on May 1st at 7:00 pm. However, Texas superintendent John Kuhn and Chicago Teachers’ Union president Karen Lewis will speak at Monona Terrace on May 1st at 7:00 pm. We will use this opportunity to launch the “Reclaiming the Conversation in Education” sessions led by Edgewood College’s School of Education (More info to follow). UPDATE 4/14/14: Unfortunately, Diane Ravitch will not be able to attend the May 1st event in Madison due to an injury, but Chicago Teachers Union president Karen Lewis and Texas school superintendent John Kuhn are confirmed. Click here for details on the exciting new lineup! Update: SPARC HAS TICKETS to the May 1 Diane Ravitch event! If you’d like to attend, please email SunPrairieAction@gmail.com or call Heather at (608) 572-1696(608) 572-1696 to make arrangements. Suggested donation is $5. Advance tickets recommended for this can’t-miss event for parents, educators, and anyone who wants to know more about the landscape of public education. Public education and community schools advocate Diane Ravitch will speak on May 1st 2014 in Madison at the Monona Terrace at 7:00pm. This is the rescheduled event originally planned for last fall, and is sponsored by Edgewood College’s School of Education, The Progressive, Midwest Family Broadcasting, Madison Teachers Inc. Wisconsin Education Association Council. A grassroots networking social event begins at 5:30, and SPARC will join other education advocacy groups to connect with each other and point event attendees toward local action teams and other those who share their concerns. SPARC and other area grassroots teams are proud co-sponsors of this exciting event. After her talk about the destructive elements of education reform, Diane will sign copies of her new book, Reign of Error. The suggested donation for the public talk is $5 – $10. Tickets available at the Progressive, Edgewood, MTI, and same day at the event. There will be a Grassroots Networking Get-Together from 5:30-6:30. For more information on getting a free table at the networking event, contact Andrea Potter at the Progressive 608-257-4626 608-257-4626. Come early to connect with local action teams and learn how YOU can get involved locally to address public education issues in your community. If you’ve been following education news and upcoming legislation in Wisconsin, you are undoubtedly aware that there are several bills on the table this session that would severely undermine local control and weaken accountability of charter schools. Many of these measures are being drafted and supported by the lobbyists of for-profit voucher and charter ventures, such as the American Federation for Children and ALEC. And Wisconsin is not the only state seeing the impact and influence of these efforts. Nation-wide, this privatization agenda is being enacted by legislators who put political games before the needs of students and are consolidating power at the state level to hand our schools over to private interests, against our will and without our consent. Diane Ravitch has been chronicling that process for over 20 years. After serving in the Education cabinets of President George H.W. Bush and Bill Clinton, Dr. Ravitch soon became the nation’s foremost authority on dangers of moving toward an increasingly standardized system of assessing our students and our schools, and how this system is tied to a larger privatization movement. Her books include Reign of Error: The Hoax of the Privatization Movement and the Danger to America’s Public Schools (New York: Knopf, 2013); The Death and Life of the Great American School System: How Testing and Choice Are Undermining Education (2010); The Language Police: How Pressure Groups Restrict What Students Learn (New York: Knopf, 2003); and Left Back: A Century of Battles Over School Reform (New York: Simon & Schuster, 2000/2001). Over the years, her positions have evolved as the political education landscape has changed and the influence of an agenda to privatize public education has become increasingly pervasive. Her work, including her extremely popular blog and her new book, help shine light on how outside forces and special interest groups are shaping education policy and “reform” in Wisconsin, influencing legislation, and pouring unprecedented amounts of money into Wisconsin campaigns. The current legislative session saw a slew of bills that undermine local authority and remove taxpayers from the decision-making process essential to ensuring that our public schools best serve the needs of our specific communities. Such legislation, coupled with big-money influence of the special interests behind them, are a very real and very dangerous threat to public education in Wisconsin. Please join us at this absolutely critical time to discuss what we can do locally to address these issues, and why the big picture of what’s going on nationally matters to all of us. What Does Reign of Error Mean? In anticipation of the event, SPARC held a Community Conversation last fall: Why Public Education Matters: Locally, Nationally, Now with Ruth Conniff of The Progressive and Tim Slekar, Dean of the School of Education, Edgewood College, and Rep. Gary Hebl. Thanks to all who attended – you can learn more about local action by checking out our Action Guide To Standing Up for Local Schools and Local Control. Full video coverage of our forum! Candidate introductions begin at the 4:20 mark. 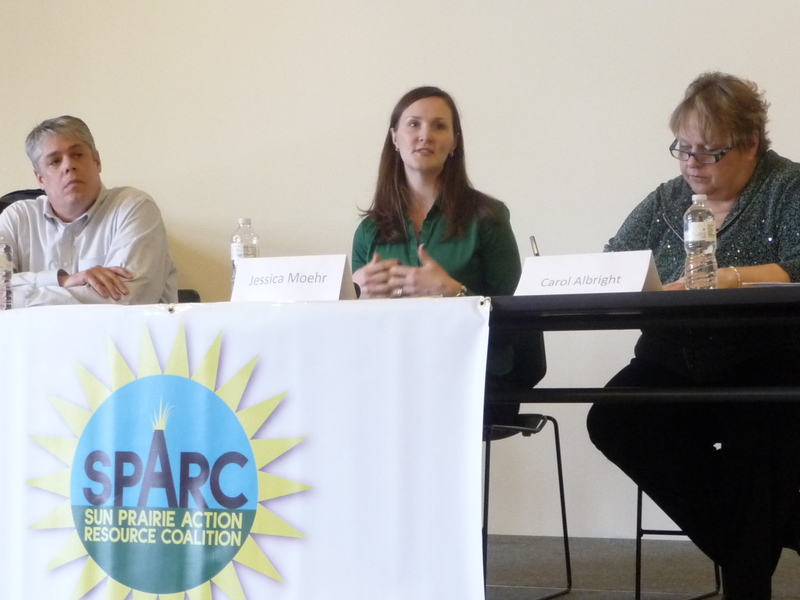 SPARC hosted a lively forum with all three candidates for the Sun Prairie School Board on Sunday, March 16, 2014 at the Sun Prairie Public Library. The event was moderated by Diane Martin Liebert, member and past president of the Madison League of Women Voters. One of SPARC’s main goals as a community civic and volunteer organization is to help make sure voters know more about who is running for local offices, and to provide opportunities for the candidates to share their views with the community. We believe that local engagement and local action is the key to a thriving community, where every voice is valued and every perspective is heard. 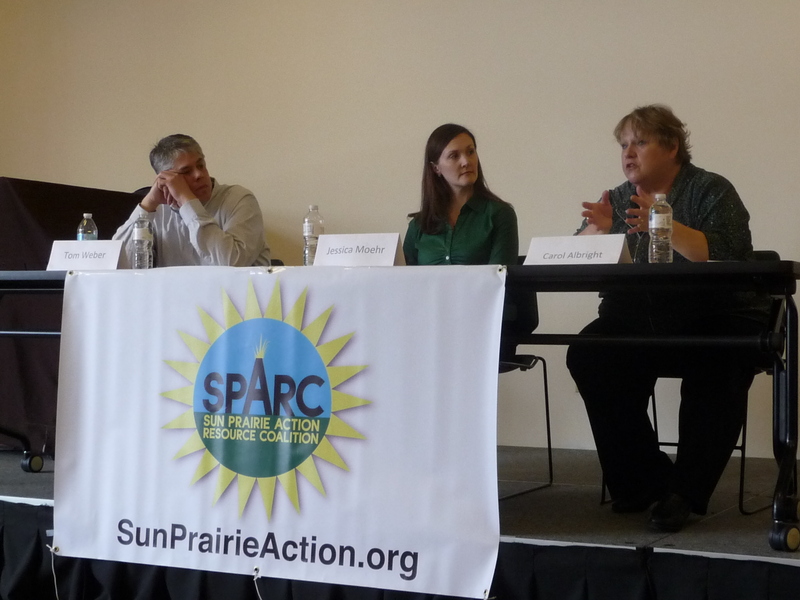 SPARC put out a call for questions to its members and the wider community, and then curated a set of questions that best represented the concerns and interests of Sun Prairie. None of the candidates had access to the questions prior to the event. Since one of the candidates, Carol Albright is a member of SPARC, it was very important to us to ensure the process be fair to all the candidates, and that a neutral third party moderate the event. We thank all who attended the event and submitted questions for consideration. Thanks, too, to Diane Martin-Liebert for her excellent moderation skills, and to the candidates for taking the time to share their time and thoughts with the larger community. The questions and complete event agenda are posted below the video. See the STAR coverage here. Dane County League of Women Voters Q&A here. Wisconsin State Journal Q&A here. Candidate Introductions: Each candidate may have up to 5 minutes to tell about themselves, their vision for education and why they are running for school board. Forum Questions. Candidates will take turns answering each question. Up to three minutes will be allowed for each answer. The questions were solicited and compiled by SPARC members and represent the concerns of local voters. Some school boards see themselves strictly as policy makers; some are more involved in school operations; others take on an advocacy role. Describe your view of the appropriate roles of the school board and the superintendent. How do you determine the appropriate levels of staffing in the district? Include your thoughts about levels for administration, teachers and staff. Equity can be defined either as providing the same educational opportunities for all, or providing differing instruction based on interests and abilities (such as grouping by reading ability, accelerated or AP classes, tech ed. etc). Research and opinion is split on what equity is and how to best close the significant achievement gaps while maximizing learning for all students. Given that Wisconsin has one of the highest achievement gaps, what does equity mean to you? If you were to walk into a classroom in Sun Prairie and see your vision of equity being carried out, describe what this would look like/what would you see? How do you believe the current testing model impacts Sun Prairie students? In a presentation to the School Board last fall on the SnackSmart program, SPARC made specific recommendations to the board regarding student hunger in our schools and how we could partner to address it. The recommendations included establishing a hunger task force, designating more resources and funds to meeting snack needs in the schools, and proactive promotion of the school breakfast program. So far, no action has been taken on these recommendations. Do you support establishing a Hunger Taskforce and how do you think the issue of hunger should be addressed in our public schools? If growth slows in the district, funding would be reduced and Sun Prairie could find itself needing to make cuts like many districts in the state currently are doing. What would the district need to do if this happens? In the post-Act 10 political environment, there is a marked decline in the morale of teachers and staff. Many educators in our district and across the state do not feel free to share their views with the administration and school board and feel like they do not have voice in the decision making process. What will you do to address these concerns and how do you think the community can and should support its teachers and staff? Transparency and community involvement are at the heart of SPARC’s mission. The Special Electors Meeting that was held to re-vote on the bussing issue last year demonstrates problems with communication between the Board and the community. Those who opposed the process felt shut out of it, while those who participated in the process felt that the board was simply dissatisfied with the results of the Annual Meeting. As an elected representative what would you do to inform and engage the community? The election is April 1st! If you’ll be out of town, be sure to vote early at City Hall or by requesting an absentee ballot in the mail! The 2014 Spring Election will be held on April 1, with early/absentee voting by mail or in person at City Hall from Monday March 17 to March 28. Sun Prairie’s spring break falls over election day this year, so if you have travel plans, be sure to make arrangements to vote early! Spring elections have notoriously low turnouts and one of SPARC’s goals is to turn that turnout around by helping make our community aware of the enormous importance of local elections! In Sun Prairie, we have School Board and City Council seats, plus two Dane County referenda and several uncontested judicial and county board seats on the ballot. If you aren’t sure where to vote, what district you live in, or how to register to vote, please visit https://myvote.wi.gov/. You can also learn more about the upcoming elections at the Government Accountability Board’s website. Click here for the Dane County League of Women Voters questionnaires for all candidates. District 1: Incumbent alder Hariah Hutkowski is running unopposed. District 2: Incumbent Jonathan Freund is running unopposed. While SPARC does not endorse candidates, since we prioritize openness and transparency at all levels of government and civic engagement, voters should know that three candidates on the local spring ballot are members of our grassroots action team: Carol Albright (School Board), Al Guyant (City Council, District 4) , and Nick Zwiefel (incumbent Dane County Board Supervisor – running unopposed). SPARC thanks all who stepped up to serve our community this year and encourages every eligible voter to make an informed decision at the ballot box on April 1st – or during the early voting period from March 17-28!